The Grape Basket quilt block is one of dozens of "basket" blocks. Many a quilt has been made of only basket blocks and no two blocks were the same. 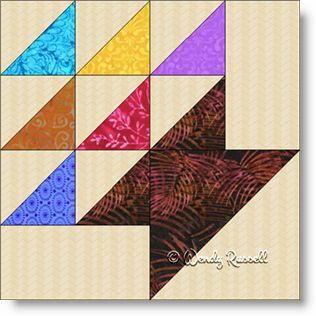 Generally, the basket type of quilt block is made of half square triangles, rectangles and sometimes squares. In the example shown, I have made the basket with a variety of "flowers". The sample quilts show a large quilt, set on point with sashing between the quilt blocks, and a single block set medallion style, and "framed" like a picture. You are only limited to your imagination.